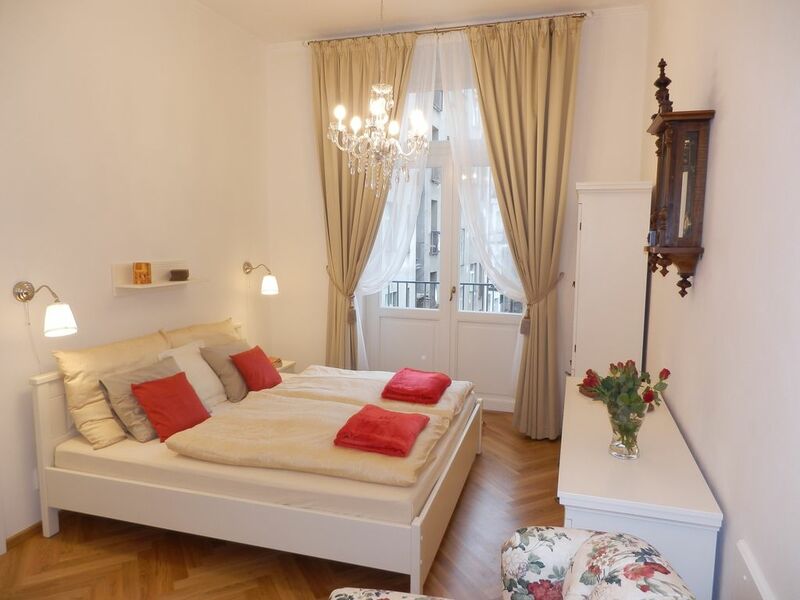 WELCOME TO OUR COMFORTABLE ONE BEDROOM APARTMENT, CENTRAL PRAGUE. ACROSS THE ROAD FROM A PARK AND THE RIVER VLTAVA, THIS APARTMENT IS A PERFECT BASE FOR EXPLORING THE CITY. •Provides comfort for 2 persons. •LIVING ROOM with 2 wing chairs and coffee table + KING SIZE BED, equipped with all bedding. •Separate, fully equipped KITCHEN (coffee machine, fridge/freezer, microwave, toaster, kettle, stove, oven and all other necessary cooking utensils). •BATHROOM with shower, washbasin and toilet, fresh towels, hair dryer, WASHING MACHINE. •HALL with wardrobe provides enough storage space. •Large BALCONY with 2 chairs & table. •CABLE TV (news & sports channel/s in English, German, Italian, French, Spanish and Russian). •CURTAINS available in all rooms. •Apartment situated on the 4th floor, LIFT available, barrier-free side entrance directly to the lift. •WE ARE ALWAYS HERE TO WELCOME OUR GUESTS. Please feel free to contact us with any questions! •Before we leave you to enjoy and explore Prague, we provide INFORMATION with regards to PUBLIC TRANSPORT, MAPS, PLACES TO VISIT, things to see and eat as well as walking routes. •We can arrange a TRANSPORT SERVICE FROM/TO THE AIRPORT OR TRAIN (BUS) STATION on request for a very reasonable price. We would wait for you in the arrivals hall and take you directly to the apartment – VERY MUCH APPRECIATED BY OUR GUESTS. •The apartment is ideal for people who want a comfortable base from which to explore the very best Prague has to offer. Very good location makes prime tourist locations easily accessible. Q- Are you situated near the city? A- Yes. Thanks to a favourable location (centrally located near the river) you are 5-10 MINUTES FROM THE MAJOR SITES such as Prague Castle, Charles Bridge, Old Town Square, Jewish Quarter etc. Q - Is the area safe? A – Yes, and only 5 minutes from the nearest tram stop. Q - What time is check in? A – From 2 pm. Q - Can I check in early? A – Please contact us in advance. If there is a guest the night before your arrival, we would look after your luggage before we make the place nice and clean for you. Q- Can I check in late? A- Yes, we accept check-in until late in the afternoon/evening. Q - What time is check out? A – Until 10 am. Q - Can I check out late? A - A later check out may be agreed individually in advance – please get in touch with us. Hello, thank you for looking at our listing. My name is Jarka. Together with a family, I love to travel to the mountains - in summer as well as in winter - we like hiking, cross country and alpine skiing. We know how nice it is having a home away from home, so we look forward to meeting you and making your stay in Prague a great one! Please feel free to get in touch to ask any questions. We have been with HomeAway/VRBO from 2014, thus having a lot of experience to make your stay pleasant and comfortable. COMFORTABLE ONE BEDROOM APARTMENT, CENTRAL PRAGUE. ACROSS THE ROAD FROM A PARK AND THE RIVER VLTAVA, THIS APARTMENT IS A PERFECT BASE FOR EXPLORING THE CITY. Bathroom with a shower, washbasin and WC & washing machine. LIVING ROOM with 2 comfortable wing chairs and coffee table + KING SIZE BED, equipped with all bedding. The kitchen offers fridge/freezer, microwave, toaster, kettle, stove, oven and all other necessary cooking utensils! A table with 2 chairs in the kitchen. CABLE TV (news & sports channel/s in English, German, Italian, French, Spanish and Russian). Large BALCONY with 2 chairs & table. HOUSE RULES: •Please note this is a non-smoking, smoking allowed at the balkony. Pet-free apartment. No parties allowed. •Please keep the place tidy. If you break something or the equipment does not work, please say so straight away, and we can get it fixed/replaced before next guests arrive. And most importantly of all, enjoy your stay!! Looking forward to welcome you to Prague! Michael and Jarka have provided the perfect place to stay in a picturesque city. The apartment has all the amenities a traveler could want. Beautifully decorated, comfortable in every way and centrally located for seeing all that Prague has to offer. We were so happy to have spent two weeks in this area. Michael remained in contact to ensure that all was to our liking. They even provided a pickup service to and from the airport. What a kind offering and a luxury! We hope to return one day and would definitely stay in this apartment. Beautifully apartment. Very well appointed, with excellent location. The owner has provided all sorts of information that made our stay easy. The kitchen is fabulous, and the washing machine very welcomed! Highest recommendation. The apartment was emaculate and location is perfect. Very nice neighbourhood, just a short tram ride to all attractions. Jarka and Michal are very welcoming, professional hosts and I would not hesitate to stay there again. We so enjoyed our stay at your Prague apartment! It was located within easy walking distance to Prague's sightseeing attractions while offering a quiet place to escape the crowds. We enjoyed many of the local restaurants you recommended near the apartment as well. Thanks for helping to make our first visit to Prague one to remember! 5 Stars are not enough for this lovely apartment! My husband & I stayed in this incredible apartment for 3 weeks...and we are so happy that we did. Jarka & Michal are the absolute best hosts we have met in many years of travel. They were always friendly, reliable & accomodating. Communication with them was always open & timely: they made us feel very much at home. This apartment goes beyond 5 stars! It is very clean, efficient & extemely well-equipped - other than being very quiet yet centrally located. Thank you for our comfortable stay in our new favourite city in Europe! If we can visit Prague in the future, we will definitely stay in your apartment once again. The apartment was only a short walk along the river to the old town in Prague. The owners are professional, caring and considerate. It was easy to get in and out and I enjoyed my stay! •Thanks to a favourable location (centrally located near the river) you are 10-15 MINUTES FROM THE MAJOR SITES such as Prague Castle, Charles Bridge, Old Town Square, Jewish Quarter etc. •Nearest TRAM STOP only 1 MINUTE FROM THE APARTMENT. •TESCO SUPERMARKET (open daily from 7am until 9pm) 200m from the apartment. •A place called ´ANDEL´ (the name means ´Angel´ in the Czech language) can be reached by foot in 5 minutes - ´ANDEL´ is an area with plenty of shops, restaurants (both with Czech and international cuisine), cinema, ATMs, cafes, pubs, bars, and clubs as well as a five-star SHOPPING MALL. The area is also served by Prague Metro´s (subway) B line. Wir bieten einen zuverlässigen Transport-Service vom / zum Flughafen oder Bahnhof (EUR 20,-). We can arrange a secure and reliable transport service from/to the Airport or Train Station (EUR 20,-). WIR MELDEN UNS AUF JEDEN FALL EIN PAAR TAGE VON IHRER ANKUNFT um alle weiteren Details wie Informationen zu Anreise, Schlüsselübergabe usw. abzusprechen. WE WILL GET IN TOUCH A FEW DAYS BEFORE YOUR ARRIVAL to agree upon all necessary details such as key handover, check-in time etc.